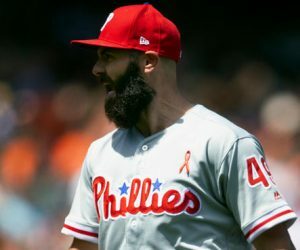 RUPP TO THE RESCUE AS PHILLIES’ JUGGERNAUT ROLLS ON! 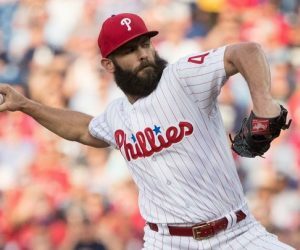 Thanks to some clutch ninth-inning hitting, the Phillies completed their three-game sweep, winning 3-0 at Nationals Park. It was the Phillies’ first sweep at Nationals Park since 2009. 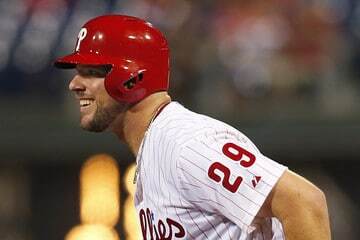 Scoreless heading into the ninth inning, the Phillies loaded the bases with one out and Jonathan Papelbon on the mound. On a 2-2 pitch, Cameron Rupp (above) doubled over Bryce Harper’s head in right field to score Odubel Herrera and Freddy Galvis. Two batters later, David Lough reached base on an infield single, scoring Maikel Franco. All three runs were charged to Nationals reliever Felipe Rivero, who allowed two hits and an intentional walk to start the inning. 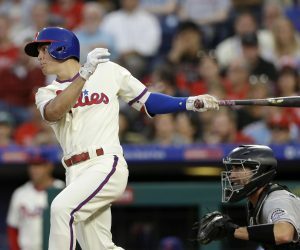 The upstart Phillies finished their road trip at 5-1 and 12-10 for the season. The Nationals collected four hits in the game against four Phillies pitchers and scored only three runs during the three-game series.